1960 characterized a turning point in the lives of women (and men!) around the Globe: for the first time, the birth control pill had been approved! This occurred in the United States and after only two years the efforts of researchers seemed to have paid off, as 1,2 million of American women were on the pill. For a while, women regarded the tiny colourful pill as a victory in a World dominated by men, as it ended an era of endless baby making and marrying the wrong guy too early. Unfortunately, the small drug did not come without costs: besides the religious, cultural and political controversies it generated, women started to feel the side effects in their bodies, which ranged from the soft and frequent mood changes, weight gain and acne to the severe but rare blood clots, heart attacks and strokes. The question that came to the mind of many was then: what about a male birth control pill? Despite the popularity of the idea, a simple analysis of demand and supply for the product shows its lack of viability. Let me start with the demand side. Why on earth would men demand a birth control pill? Rationally, it would only compensate if the expected benefits exceeded the expected costs. However, there are practically no benefits! Indeed, pregnancy imposes a higher cost on women than men, so the expected benefit from avoiding one is small for men. As for the expected costs, take into account worse or as negative side effects as women pills and the price men would have to pay for the drug. The obvious conclusion is that men are very unlikely to try this drug, which is confirmed by the scarce empirical evidence. Indeed, a study by Kaiser Family Foundation for the USA found that even if the male birth control pill was provided freely, 29% of men would never use it. Women were even more sceptical regarding male use of the drug: 45% did not believe their partners would try it. From a supply point of view, incentives are also weak: so far, the development of male birth control pills has shown to have more costs than expected return. R&D projects have started in the 70’s at Oregon, USA and then focused on the use of hormones to control sperm production. However, they were abandoned in phase I due to the adverse effects in men’s eyes. In the 90’s, a revival of the study of the male birth control pill has occurred: despite the different products tested, which ranged from papaya seeds to drugs such as Adjudin, Gamendazol or Trestolone, all failed during animal testing or phase I, after huge investments of time and resources. And in 2007, studies slowed down. Pharmaceuticals finally understood by past experience that the product would probably sell at a price that would not compensate the costs, if it sold at all. Indeed, besides the studies pointing out that demand is weak, entering with a new pill in the market could lead to a decrease in the whole price of pills (including women’s pills markets), due to increased competition. So, it was mainly universities and non profit organizations which continued research in the field. More recently, scientists have isolated JQ1, a molecule which blocks a protein essential to produce sperm in mice and that has shown minimal adverse effects on animals. As such, a revival of enthusiasm on the male birth control pill has aroused, contaminating even prominent magazines such as the Economist. But in my opinion, it is again a false promise, as the product is not viable from an economic perspective. The new pill (if it exists!) will be tested for efficacy over “several years” and due to the high costs of R&D, will be abandoned afterwards after the finding of some side effect on men. And the story will go on, over and over again. At last, until the day when a really high skilled economist kills the dream once and for all. Categories: Access to health care, Demand for health care, Health Economics, Innovation in health care, Pharmaceuticals | Tags: expected benefits from male birth control pill, male birth control pill, pharmaceuticals and the male birth control pill | Permalink. Medical knowledge and technology is rapidly developing in our part of the world, with new treatments and diagnostics from new and improved medicines. At the same time, the pharmaceutical industry is more aggressive than ever, and through their marketing and advertising we are reminded of the frailty of our health, independent of our health conditions. The industry creates a need for effective and easy treatments for illnesses we might get in the future. This development has caused a rising demand for health care. The increase is larger than what seems to be the possible supply within a publicly funded health care system. The result of higher pressure on efficiency and stricter priorities has been that the doctors have to make decisions on the patient’s needs. Each patient’s needs must be valued against economic regards. This places the doctors in difficult positions. What is a need? Are we born with these needs, or do we create them ourselves? If not all demand should be understood as needs, how can we separate the legitimate needs, and whose job is it to do so? The basic principle in most public health care systems is that the services should be distributed according to the patient’s needs. This implies that the services first and foremost are supplied to “those who need it the most”. But the problem arises when someone has to decide which needs are more important than others. Even though doctors and medical personnel have the best prerequisits to decide on the matter, it may be unreasonable to demand that they take all the responsibility. If something goes wrong, they will be the first to be blamed. Is the system in itself not responsible for a fair distribution of medical care and treatments? Norway implemented a system of primary doctors for each citizen in 2001, and since then the consumption of medical services has increased more than previously. The capacity is not large enough, and so the waiting periods for certain treatments and care facilities are too long. In order to do something about this excess demand, we have to evaluate social norms and really assess our need for health care. Needs are mostly created by society, and demand is thus composed of both subjective, social and objective components. If society created the needs, can’t society also take responsibility and decrease the demand to a sustainable level? It is a difficult challenge to deal with, and in all fairness, every branch of society should participate in order to fight this increasing demand issue. Categories: Demand for health care, Health Economics | Permalink. The Demand for Health and Health care can be a problematic policy issue. And in today’s society I would guess that people, as for other things, only demand more and better health care as time passes. Unfortunately, there can’t be a hospital serving every need on every corner at every time. That would be too expensive, and not give the best or most effective medical care. It is necessary to prioritize. And this can be hard to do when it comes to the matter of people’s health. I have a friend who had to give birth to her baby in her car. And her husband had to deliver the baby. Why? They just live too far away from the hospital. When she got into labor, they didn’t manage to reach the hospital in time. So for her, the supply of health care did not meet her demand at all. Of course you can say that living that far away from the hospital is a choice. And theoretically it is. But still, it’s not always that black and white in the real life. For a Government, it’s important to be pragmatic about decisions concerning issues like supply and demand of health and health care. However, there’s even more to this matter than just meeting a demand in the most effective way. A hospital can be so much more than just a supplier of health care. In my hometown, Bergen, we have a hospital which is one of the largest employers on the West Coast of Norway. That is a big deal. And in the small communities in Norway, a hospital can matter even more. To put it somewhat extremely, the existence or non-existence of a hospital can be crucial to the work market in a small town. And the work market can be crucial to the existence of a town. So, you can imagine that facing the demand of health and health care in the best possible way is hard. And I really don’t know how to do it. I guess everybody in charge just needs to do their best. And I hope that they do! Are we sick of this crisis? Without second thought, you’d say Yes, I am sick, tired of the current economic situation. However, have you ever wondered if you are getting sick because of it? Probably you haven’t and now, intuitively, you may be tempted to answer positively. The rising unemployment leads to a reduction in household consumption and tax revenues, which imply that countries cut in the national budgets, including the health one. To do so, you think, countries may introduce/increase user charges, increase the waiting times or reduce the scope of services/population covered. Even though this doesn’t affect your health directly, it might do so indirectly. In fact, research suggests that the health status of populations may actual improve during economic downturns, and many arguments may be pointed out: more leisure time allows people to exercise more; over-consumption of food, alcohol and tobacco decreases; and road-traffic and work-related accidents decrease. Even though the suicide rate tends to rise and the mental health status tends to worse, researchers say that if these hazardous effects are mitigated by adequate support programs, the health benefits of economic crises tend to overweight the risks, at least in the short-term. Noting the counterintuitive nature of these results, I tried to find empirical evidence of them, studying the Japanese case. When we look at the Japanese governments’ health expenditures, we clearly see sharply decreases during crises periods. The first cut followed the 1997s Asian Crisis and was integrated in a boarder policy of fiscal consolidation, aimed at cutting government spending (Japan’s situation, in the 1990s, was the worst of any G7 country). The government decided to raise tax rates, to end some subsidies and to increase the patient co-payments under the national health insurance. The severe recession and the rising unemployment that followed lead to a reduction of tax revenues, aggravating this effect. Although the second decline precedes the rise of the current crisis, it may correspond to a similar austerity policy to reduce Japanese high debt. 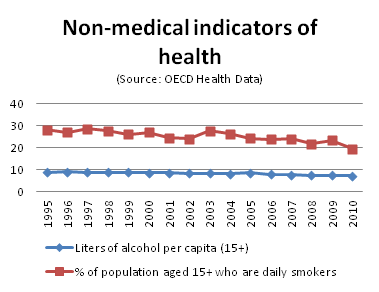 Looking at the non-medical indicators, we indeed notice a slight decrease in the percentage of daily smokers in 1997, as well as in 2007, which may be a reflect of financial constraints (eg. unemployment or rising taxes). 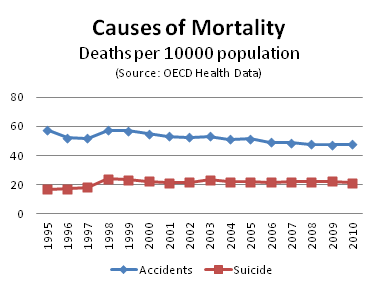 We can also notice a small reduction in the rate of accidents – either labor-related or traffic accidents -, whose link to the crisis might, however, be questionable due to the persistent pattern till the present. Even though these results are insufficient to confirm the effect suggested by literature, they at least give us a different perspective of crises periods. In fact, every coin has two sides and despite the catastrophic economic consequences, crises may be an opportunity to improve the efficiency of health systems, as well as the population health status. Philipa Mladovsky, Divya Srivastava, Jonathan Cylus, Marina Karanikolos, Tamás Evetovits, Sarah Thomson, Martin McKee. Health policy responses to the financial crisis in Europe. European Observatory on Health Systems and Policies. 2012. Toshihiro Ihori, Toru Nakazato, Masumi Kawade. Japan’s Fiscal Policies in the 1990s. 2006. 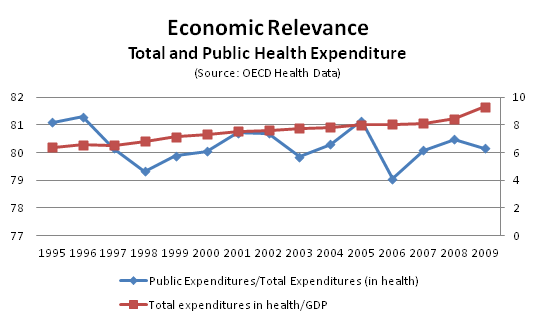 Categories: Demand for health care, Economics, Health expenditures | Permalink.